The back-to-back events have been an annual tradition in Sedalia for over two decades. Rodeo clown Todd Pettigrew says Federation Productions is excited to see familiar faces whenever the rodeo comes to Sedalia. "We get to see the faces of many people for all four nights. That is awesome for them to enjoy the event that much. We just love it." President of the NFPB, Clint Jackson, says that Sedalia is the perfect community for their sport. "Sedalia is unlike any town of its size that I know of. It's kind of become bullriding town America. It's the perfect community for it," said Jackson. "And the facilities here, you can't ask for any more. The Matthewson Center, when you put people in that facility and they get excited, you feel like you're in an 18,000-20,000 person facility and it's roarin', you just can't ask for any more." 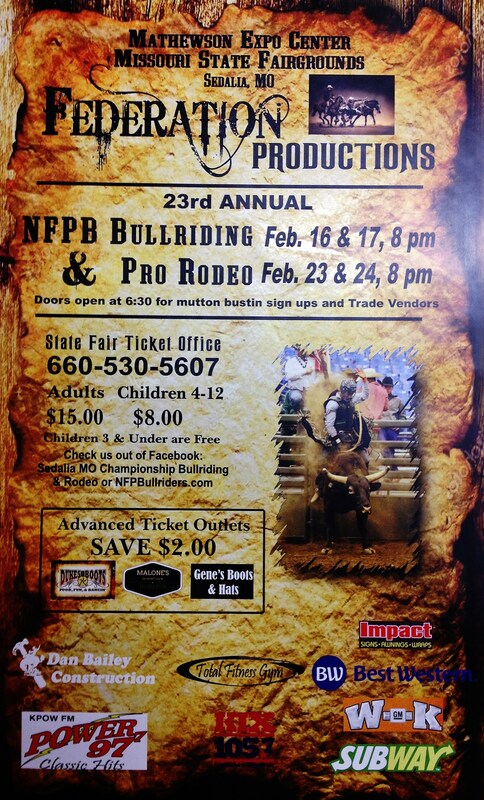 Some of the additional events will include a western trade show, pony rides, cowboy poker and mutton bustin'. Doors will open at 6:30 for 8 p.m. events each night. Advance tickets are on sale at Dukes & Boots, Malone's Irish Pub and Gene's Boots and Hats. Those that buy tickets in advance will save $2 per ticket. Prices at the door are $15 for adults and $8 for kids 4-12. Children 3 and under are admitted for free.